We are pitting against each other three different mirrorless cameras from three rival camera companies. Helping us test out these new cameras is Ellen Ho, our model for today. Check her out at @missellenho. The first camera in our lineup is the Sony A7R3, which isn’t a new camera, but it’s a great competitor for these new ones. In the middle, we have the Canon EOS-R and the Nikon Z-7 to round out the match. Special shout out to Borrow Lenses for letting us rent out all this equipment. It’s a great place to get cameras and equipment that you want to test out or use for a special shoot. Check them out here. We are doing a dynamic range test, so we are going 4 stops over and 5 stops under. By 4 stops over the cameras tend to fall apart, so we really don’t need to go any higher than that. Here are our first three images at normal EV 0 with the proper exposure set for her face. Right off the bat, we can say that the Nikon is very sensitive to light and you can already see that at EV 0 the clouds behind her are completely blown out. The Nikon wants to be underexposed. When we go one stop under at EV -1, all the shots still look good. The cameras are holding up well. There’s no trouble holding the highlights in any of the cameras. They still look good from a distance, but once you blow them up that’s where you can start to see the differences. Once we blow it up to 100%, you can see some noise around the eyes as you look, but the Canon is handling super well. Minus 4 stops is a lot of expectations from a camera, but the Canon still is doing the best in the comparison. I would say that Sony loses this round just because you are getting some discoloration next to the eye. With Minus 5 stops, the photos don’t look great. The Canon looks the best out of the three, but there is some strange streaking going on as we look at the floor. That feels like a sensor pattern to me. Even with one stop up, you can already see the highlights are blowing out. The Canon isn’t doing too well and the Nikon has the whole left wall almost white. Clearly, the Sony is doing the strongest with the overexposure. The Canon and the Sony look okay here if we zoom in on her face, but the Nikon has discoloration problems. If we look at her nose, you can tell you lose a lot of information on the highlight there. Nobody is holding down the building on the left anymore. The Nikon is just really bad on her face though. Overall, Sony did well with the overexposure, but not with the underexposure. Canon was neck and neck with Sony in overexposure and also performed the best in underexposure. Nikon was good with underexposure but definitely wasn’t able to hold anything in overexposure. A great basic test you can do with your camera is to shoot a well-lit portrait. This helps you to see the tonality, resolution, skin tones, color response. We are going to shoot a headshot of Ellen here, and also the pub graffiti sign. They’re all different lenses because we are sticking with the native lenses of each camera. These photos are straight out of the camera, we didn’t do any color adjustments or editing. Right off the bat, the Sony is darker it’s not as sensitive as the others. The Nikon is the brightest as we mentioned earlier, and the Canon seems to fit just right. The Nikon tends to have a sharper contrast, with an almost commercial feel. In order to compare the resolution we blew it up to 100%, and we can see the resolution here. We couldn’t get the Nikon autofocus to work, so we had to eyeball it (hence it might not be the best). Here the Sony a7r3 edges out the Canon. Between the Nikon and the Sony, it’s more of a color preference. Now the Canon and Sony both did very well in this test. However, since the autofocus on the Nikon wasn’t working we couldn’t do this test at all. We tested the autofocus by having Ellen walk straight toward us as we shot. As we take a look at the Sony shots, we can tell that it’s doing a good job focusing on Ellen as she walks toward us. It’s getting about 90% of those shots really sharp. The Canon was amazing, there were 33 photos and there was only one that wasn’t in focus. We started at 1600 for the ISO Test. Let’s talk a look at the grey card in each of the photos. We see some noise when we look at all of them, but the Nikon definitely has the most noise. She’s looking good though. In all of the photos, she’s still looking and none of the highlights are overexposed. The noise is looking colorful on the Sony. Nikon is looking gritty, whereas the Canon is still holding. The Nikon is now the grittiest, but color-wise it seems the most neutral just a tad green. The Nikon does have some consistency in the photos, but the Canon is just performing better overall. I’m shocked that it is the cleanest. If you take a look at the Sony and Nikon, it is turning all sorts of colors. The Canon has finally started to fall apart, but it’s not colorful. We are first going to shoot in 4k resolution to see how they perform. The Sony and Nikon are both full-frame cameras, so we shot this side by side. Whereas the Canon has a crop sensor, so we had to push it way back to get her into the frame. The Canon has great color and sharpness in the video. The Sony looks a little bit more naturalistic. The Nikon is really sharp and heavily contrasted, which personally isn’t my favorite. Based upon the colors and resolution, the Sony is my winner. Wow, the Canon looks terrible in 1080p (Watch video to see comparison). The Sony in the 1080p doesn’t look amazing either. The Nikon looks even more overly contrasted and sharp. I was really impressed by the ISO, dynamic range, and autofocusing capabilities of the Canon, but I felt like because it doesn’t do 4k in a non-crop mode as a crossover camera I wouldn’t buy it. It’s great for still photography. 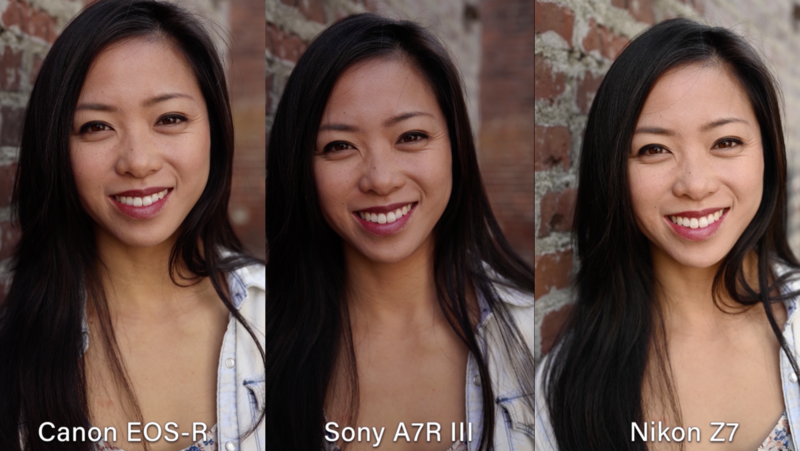 The Sony A7R3 is a better all-rounder camera especially if you are shooting stills and video. Even though it doesn’t have a great dynamic range, and the ISO doesn’t do too well. I’m really disappointed by the Nikon Z7, just because I had such high hopes for it after testing out the Nikon D850. It, unfortunately, didn’t quite make the mark in the mirrorless department. It didn’t quite meet the dynamic range or ISO that the Canon was able to achieve. For Stills and Videos, my pick is Sony A7R3. A couple things that we found out is that Canon and Nikon only has one card. Strangely, the Nikon can only be shot on an XQD card, not a regular SD card. The Sony a7R III has two SD card slots- one is superfast UHS II card compatible (slot 1) and the other (slot 2) is a regular SD card slot. Yes, sorry for the typo. It was supposed to be the Nikon that only has one slot. Thanks for the correction!